It’s getting warmer these few days, becoming a good time to make something cold and sweet. Coconut milk pudding is a kind of old fashioned dim sum you might find in some yam cha restaurants. I made this dessert the other day to treat myself after a long day’s work. There’s one secret ingredient to make this creamy dessert more delicate and smooth cotton like. Guess what? It’s egg white. It makes the pudding not so springy after adding the gelatine powder. One of my friends commented it’s the texture of coconut milk pudding he likes the most. Lightly whisk the egg white with a fork. Set aside. Use a deep pot, cook coconut milk, milk and sugar over medium heat until the sugar is completely dissolved. You don’t need to bring it to a boil, just heat enough to help dissolve the sugar. Stir in the whisked egg white. Remove the pot from the heat. Sprinkle the gelatine powder into the coconut milk mixture and stir to combine well. Make sure the gelatine powder is completely dissolved. Sift the mixture through a fine sieve. Pour into jelly moulds evenly. Chill in fridge for at least 3 hours, or until it’s set. Enjoy. The egg white should be beaten well. Otherwise, your pudding will have some lumps. Yet, no need to beat too hard or too long because you don’t want too many bubbles. Don't heat the coconut milk mixture too hot. Otherwise, the egg white will be cooked instantly and turn into egg white drops. If you want smoothest pudding, remember to sift the coconut milk mixture. Or you might want to skip this step if you like. 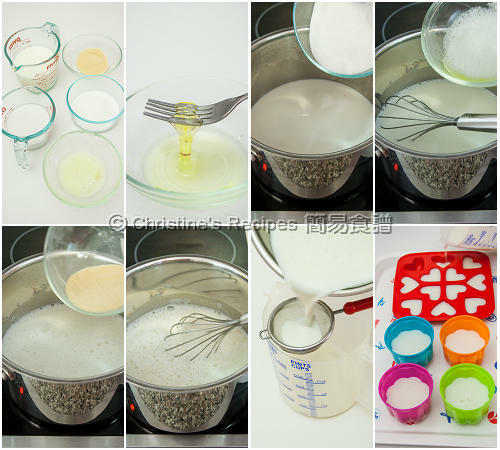 After sprinkling the gelatine powder, make sure you mix it very well until it’s completely dissolved. 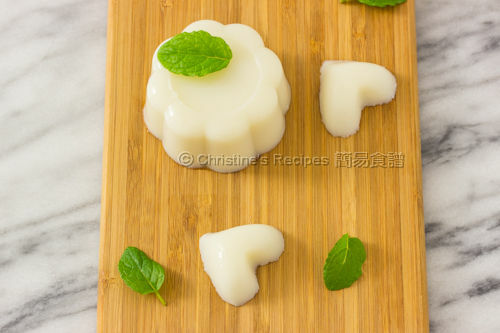 Hello love to try this recipe but only have sheets of gelatine so how much should I use? You might replace with the same amount (weight) of gelatine sheet to make the pudding. Soak it in cold water to soften and squeeze out the water. Then add in the coconut milk mixture to dissolve. Thank you for sharing this recipe. I love all things coconut. Can I use agar agar instead of gelatine? The texture produced by agar agar is very different. I love anything with coconut. This looks so refreshing and perfect for the summer time. Hi Christine, can I use evaporated milk? the good old coconut pudding is a childhood favourite! yummo! Love your recipes! Should we use whole milk for this recipe? Yes, you'll get the best flavour if you use whole milk. Why not? Feel free to experiment. Is whole milk same As fresh milk? Whole milk contains higher fat content that could be fresh or UHT milk. Can i don't add egg white? The egg white also helps set the coconut milk and produces a nice texture, very different from just using gelatine. If you skip the egg white, you have to adjust the amount of gelatin as well. The end result will be different from this recipe produces. Thxs for sharing this dessert receipe. 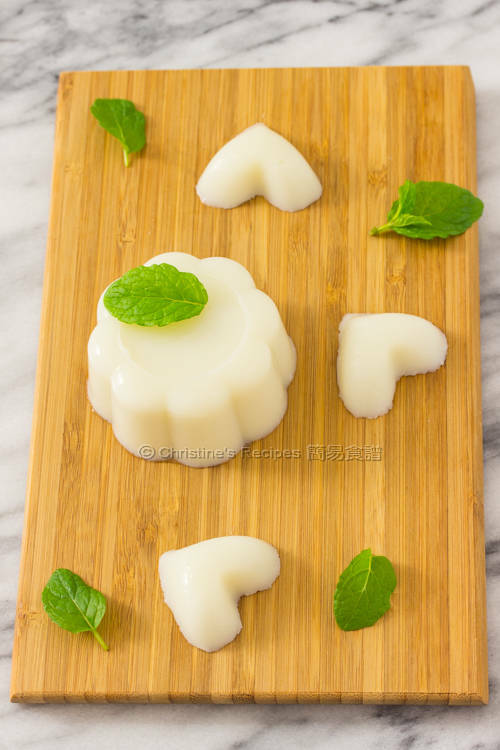 Just tried making this, and the pudding separated into two layers (one thicker whiter layer at the top - more coconutty, and the bottom slightly translucent) - It still tasted ok, but not really sure where I went wrong, whether it just wasnt mixed properly or something? I think your coconut milk was separated. Just like the situation that you'll see two layers after sitting coconut milk for a while. You have to move more quickly to mix all ingredients and chill it. Hi Christine! is it okay to use coconut milk only instead of part coconut milk and part dairy? It might slightly alter the consistency a bit. But feel free to experiment.